Arrive Bangkok, after clearing your emigration and customs you will be received and transferred to Pattaya hotel. Rest and relax at hotel. After breakfast, proceed for the Coral island tour with speedboat. Koh Larn (Coral Island) is the largest of Pattaya's archipelago. Lunch at coral island. Major attractions include viewing coral reefs from glass-bottomed boats, snorkelling, scuba diving, windsurfing, skiing and Para-sailing. Overnight at Pattaya. Breakfast at hotel check out hotel and proceed for Safari world and marine park tour .Lunch will be served at the park. Thailand’s greatest open zoo and Leisure Park that offers a great variety of entertainment for everyone. Whether it is an exciting safari drive through the picturesque African wilderness settings, an intimate encounter with our friendly dolphins, enjoy the orangutan boxing, sea lion show, cowboy stunt show, spy war etc. Safari World has it all. Overnight stay at Bangkok. After breakfast proceed for a half-day city and temples tour. 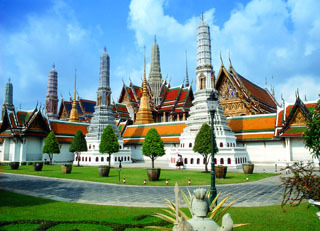 This tour brings you the 3 most distinguished temples in Bangkok: Wat Trimitr, the temple of the Golden Buddha - the statue of Buddha is made from solid gold weighting 5.5 tons; Wat Po, the temple of the Reclining Buddha - the largest and oldest in Bangkok, Wat Benchamabopit - the marble temple . Evening proceed to airport to board flight for onward journey.